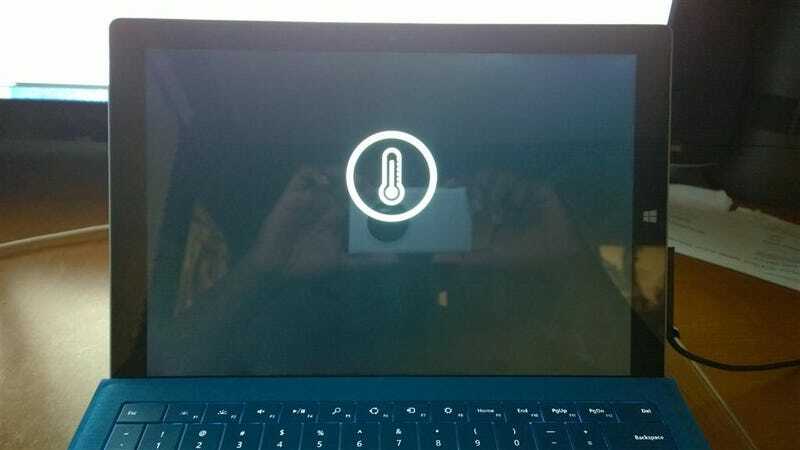 Microsoft says that your overheating Surface Pro 3 is actually not overheating at all, never mind that thermometer icon on the boot screen. For the last few weeks, Surface Pro 3 owners have taken to complaining on Microsoft's support website about the device becoming too hot to handle even during light tasks. They've even put together a spreadsheet to collect all the complaints in one place. The problem seems to occur in the higher-end Core i7 version of the Surface Pro 3. "The Surface Team is aware of a very small number of Surface Pro 3 Intel Core i7 devices that are temporarily restarting and incorrectly showing a 'Thermometer Gauge' icon while attempting to boot up. Our investigation reveals that the system is triggering this event sooner than it should for some people, only when the device restarts, and this does not occur when the device is booted and running. We have an update that will address this that will be ready for our customers as soon as possible."